3/19/2019: Congrats to Xinran, Yueyi, Azahar, Yuncong, and Le! Five (5) papers were accepted for presentation (2 oral and 3 poster) at the prestigious Transducers 2019, covering the topics of nanofabrication, soil, water and plant nutrient sensors, soil water potential sensor. 2/12/2019: The lab received a new NSF grant to develop water sensors for plants. 2/8/2019: Dr. Dong gave a Plenary Talk at Phenome 2019, Feb 6-9, Tucson, AZ. 11/15/2018: Shawana passed her Ph.D. final oral exam. Big congrats to Dr. Tabassum! 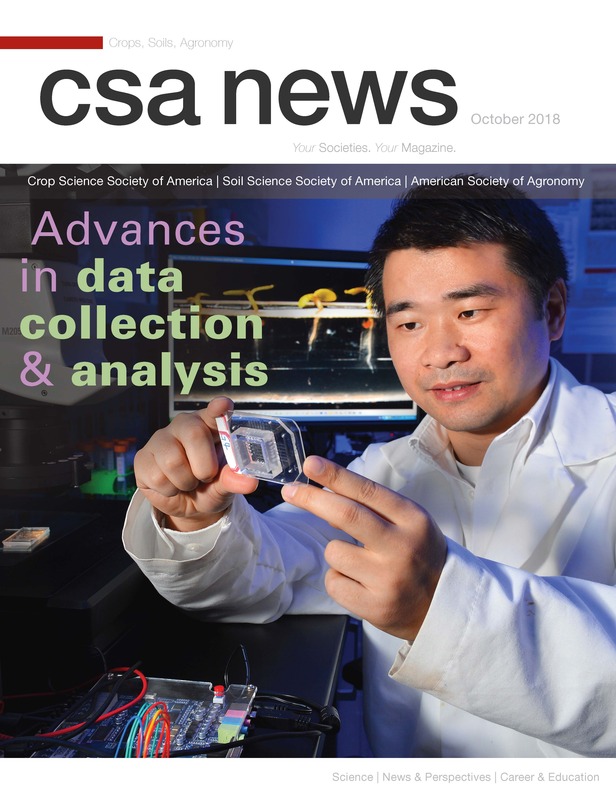 10/​17/2018: Dr. Dong was featured on the Cover of CSA News Magazine. 7/01/2018: Dr. Dong became Editor-in-Chief of Sensors and Actuators A: Physical (Elsevier). 4/12/2018: Dr. Dong has been promoted to Full Professor. Congratulations! 4/03/2018: Zhen Xu passed his Ph.D. final oral exam. Congrats to Dr. Xu! 3/29/2018: Seval OREN passed her Ph.D. final oral exam. Congrats to Dr. OREN! 1/14/2018: Dr. Dong gave a Plenary Talk on ag sensors at the Plant & Animal Genome conference (PAG XXVI), the Largest Ag-Genomics Meeting in the World, Jan. 13-17, 2018 - San Diego, CA, USA. 11/17/2017: The Lab has developed a wearable plant sensor for real-time monitoring of plant transpiration. See our new publication here. 11/17/2017: Congrats! Xuan Qiao has passed his final oral exam for a MS degree! 10/30/2017: Dr. Dong gave an invited talk on microfluidic biosensors at the IEEE Sensors Conference 2017, Oct. 29-Nov. 1, 2017, Glasgow, Scotland, UK. 10/24/2017: Dr. Dong gave a Keynote talk on plant analytics at the 21st Annual Micro Total Analysis Systems Conference (MicroTAS 2017), Oct. 22 - 26, 2017 in Savannah, GA.
10/10/2017: Qiugu successfully completed his PhD degree defense! Congratulations Dr. Wang! Well done! 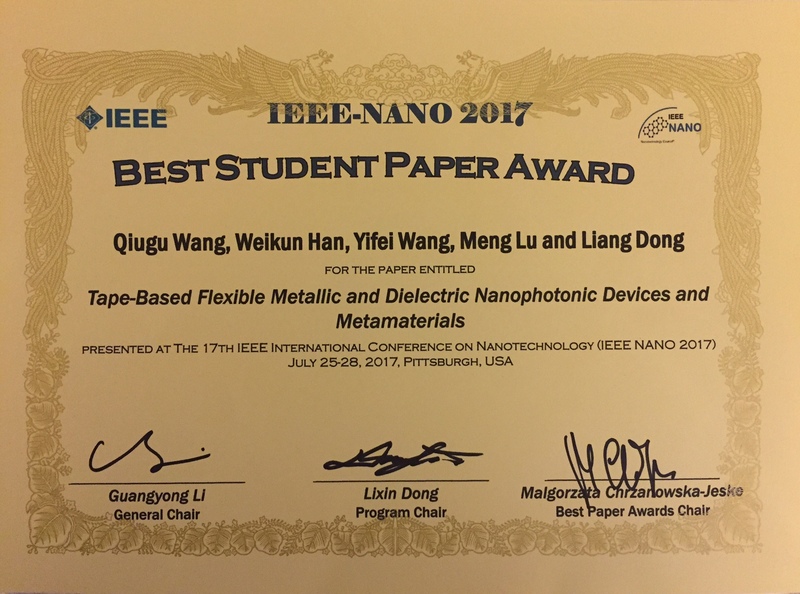 7/28/2017: We won the Best Student Paper Award at the 17th IEEE International Conference on Nanotechnology! Congrats! 6/23/2017: The lab received a grant from Analog Devices Inc. to work on environmental sensors. 6/22/2017: Outstanding Paper Award Finalist at the Transducers 2017 Conference! Congrats to Huawei, Azahar, and Yueyi! The awarded paper is titled ''In-situ, real-time monitoring of nutrient uptake on plant chip integrated with nutrient sensor." 6/14/2017: The Lab received a grant from NSF to work on liquid biopsy. 6/12/2017: The Lab received a grant from ARPA-e to work on sensors-enabled plant phenotyping. 5/4/2017: Congrats! Jikang passed his MS thesis defense. 3/1/2017: News release: Innovative research in microfluidic soil sensor featured on front cover of journal​. 2/16/2017: Congrats! The Lab has three papers accepted by Transducers 2017 as oral presentations on the topics of NEMS infrared metamaterials (Qiugu), microsensor-enabled plant nutrient use efficiency measurement (Dr. Jiang); soil nitrate sensor (Dr. Ali). 1/17/2017: Congrats! 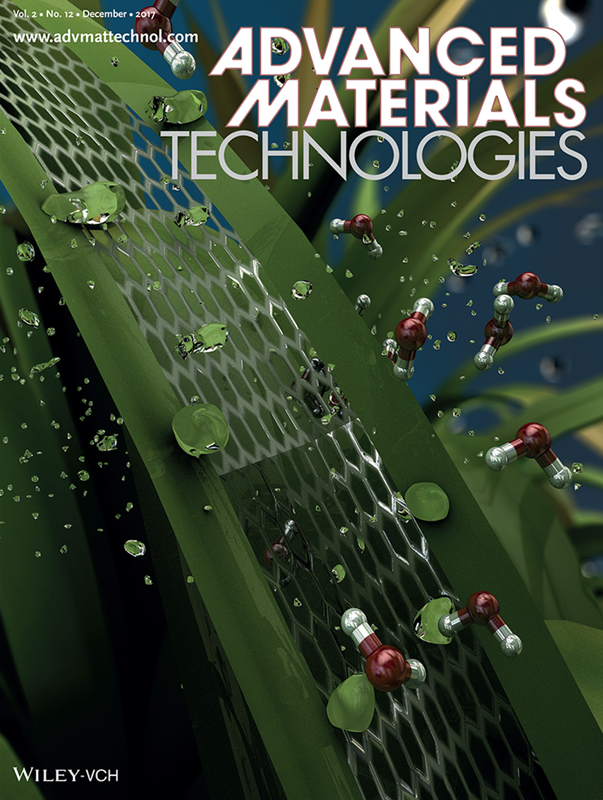 Dr. Ali's paper on microfluidic soil nutrient sensor was featured on the Front Cover of the journal Lab on a Chip! 12/21/2016: Congrats! Three papers were accepted by IEEE-NEMS 2017 as oral presentations on the topics of plant water transport measurement, microfluidic chips-enabled automated plant phenotyping, and on-chip temperature gradient generation. 12/13/2016: Congrats! Dr. Jiang's paper on microfluidic flow-through microbial fuel cell was accepted for publication in Scientific Reports. 12/9/2016: Congrats! Dr. Ali's paper on microfluidic flow-through soil nutrient sensor was accepted for publication in Lab On A Chip. 11/16/2016: Congrats! Siming Yang (co-advised by Dr. Jiming Song and Dong) passed his PhD thesis defense. Dr. Yang, congrats! 9/30/2016: Shawana's paper titled "Patterning of nanophotonic structures at optical fiber tip for refractive index sensing" was a Best Paper Award Finalist at IEEE Sensors Conference 2016. Congrats! 9/29/2016: Congrats! Zhen Xu and Qiugu Wang both passed their Prelim Exams. 9/28/2016: Congrats! Yuncong's paper on microfluidic droplet sorters was accepted for publication in Applied Physics Letters. 9/20/2016: The lab was awarded a grant from NSF. ​9/17/2016: Congrats! Azahar's paper on microfluidic nitrate sensor was accepted for publication in Sensors and Actuators B: Chemical. ​8/23/2016: Congrats! Yueyi's paper on wearable sensors was accepted for publication in IEEE Sensors Journal. 7/10/2016: Congrats! Azahar's paper on tunable nitrate sensor using wrinkled graphene oxide was accepted by RSC Advances. 4/23/2016: The lab was awarded a grant from NSF. 3/30/2016: The lab has 6 papers (2 oral + 4 posters) accepted by Hilton Head 2016. Congrats to all of us! 3/23/2016: Dr. Dong was interviewed by ABC Local 5 (Iowa) about meta-skin technology. 3/11/2016: Our research on wearable and tunable meta-skin cloak was featured by The Daily Mirror, UK. 3/4/2016: News release: "Iowa State engineers develop flexible skin that traps radar waves, cloaks objects." 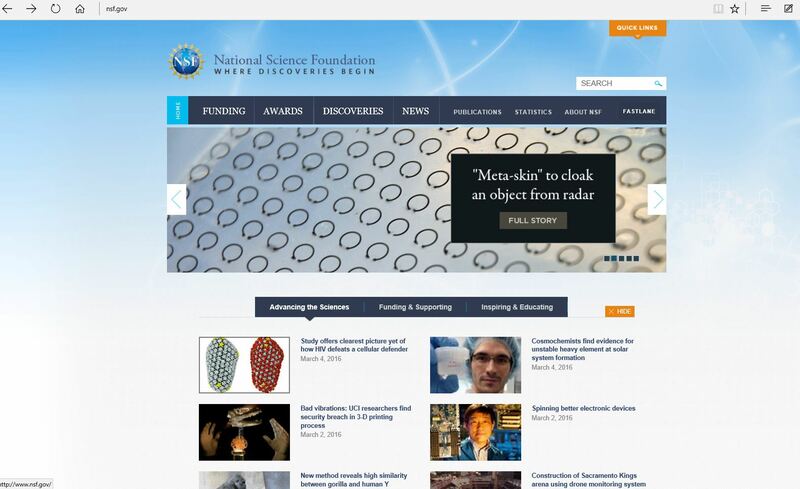 Our research on wearable and tunable meta-skin cloak was reported by Iowa State News. ​2/24/2016: Four papers were accepted by Hilton Head 2016 (Solid-State Sensors, Actuators and Microsystems Workshop). The papers cover the topics of microfluidic high-throughput screening (oral), microfluidic microbial fuel cells (poster), tunable antenna (poster), and graphene sensors for structural health monitoring and tactile sensing (poster). Congrats! 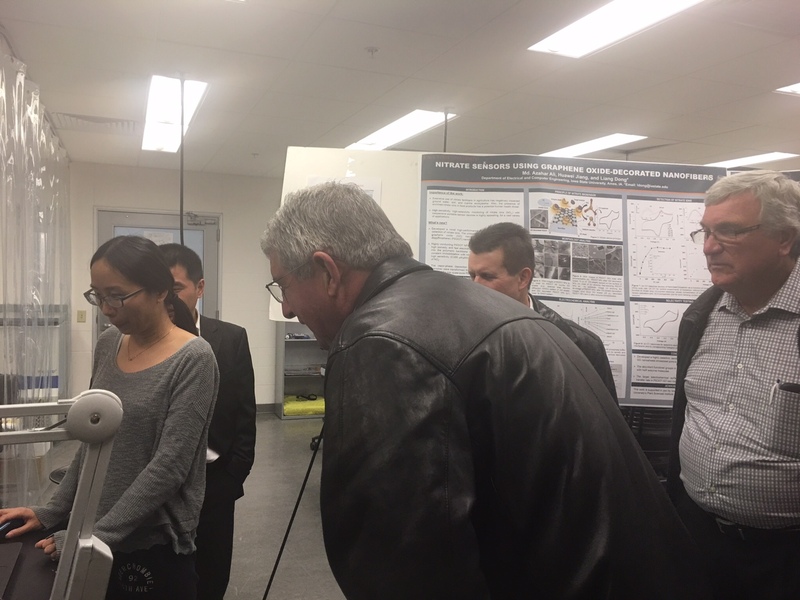 2/6/2016: Dr. Dong gave an invited talk on high-throughput screening of nematodes at the Biannual Symposium on Anthelmintics: Discovery to Resistance in San Diego, CA. 1/26/2016: Dr. Dong presented research results on volatile organic compound sensors at IEEE MEMS Conference 2016, Shanghai, China. 1/6/2016: Huawei Jiang passed her PhD thesis defense. Congrats, Dr. Jiang! 1/5/2016: Peng Liu passed his PhD thesis defense. Congrats, Dr. Liu! 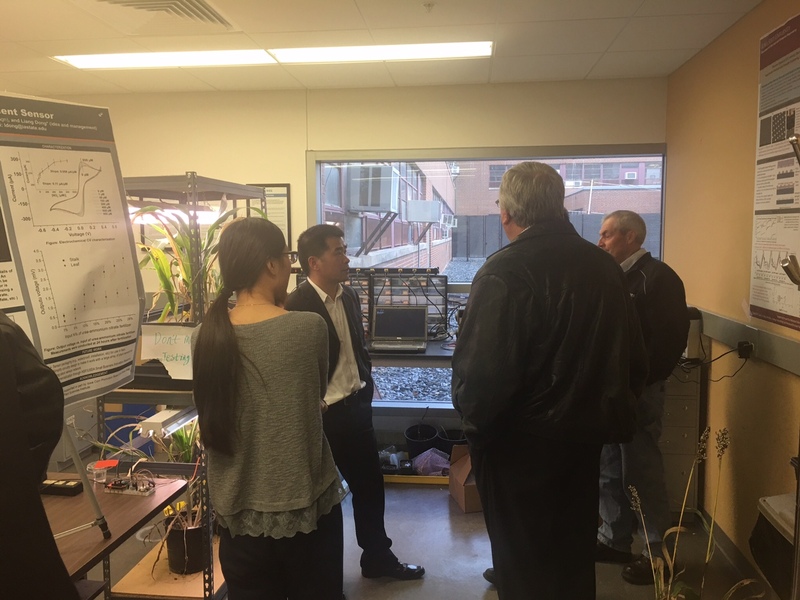 12/2/2015: Dr. David Ertl and his colleagues at Iowa Corn visited our lab and were given demos of ag sensors (1)(2)(3). ​6/9/2015: Dr. Dong gave a talk at Iowa Corn about ag sensor research and development. 6/8/2015: ​Mr. Sebastian Hargrove, an African-American undergraduate student from Tuskegee University, Tuskegee, Alabama, joined our group as a summer internship student. Sebastian will stay in our lab for eight weeks working on the miniature greenhouses and lab-on-a-chip devices. 5/8/2015: Clinton Young passed his Master's degree thesis defense. Congrats, Clinton! 08/16/2014: Xinran Wang, Tianyu Wang, and Shawana Tabassum joined our group as Ph.D. students. Tianyu and Shawana will be co-advised by Dr. Dong and Dr. Kumar. Welcome! 08/16/2014: Philip Alarcon and Zhong Zhang joined our group as an undergraduate researcher. Welcome! 06/30/2014: Congrats to Huawei and Peng for the acceptance of their papers in microTAS 2014 on microbial fuel cells and flexible metamaterials. 06/23/2014: Congratulations to Zhen Xu and Qiugu Wang for passing their Ph.D. qualifying exams. 04/28/2014: Dr. Dong gave an invited talk at the 1st International Workshop on Engineered Crops, Des Moines, Iowa. 04/02/2014: News release: "Scientists Control Plant Growth With “Greenhouse On A Chip”: Our research work on plant chips has been highlighted in NANOTEC ETC. 03/27/2014: News release: "Lab Chip Device Developed to Test Engineered Plant Traits": Our research work on plant chips has been highlighted in Science and Enterprise. 03/26/2014: News release: "Iowa State Engineer Builds Instrument to Study Effects of Genes, Environment on Plant Traits": Our plant phenotyping instrument research was featured by Iowa State News, Phys.org, dailynewsen.com, R&D Magazine, newswise.com, technobahn.com, veooz.com, etc. 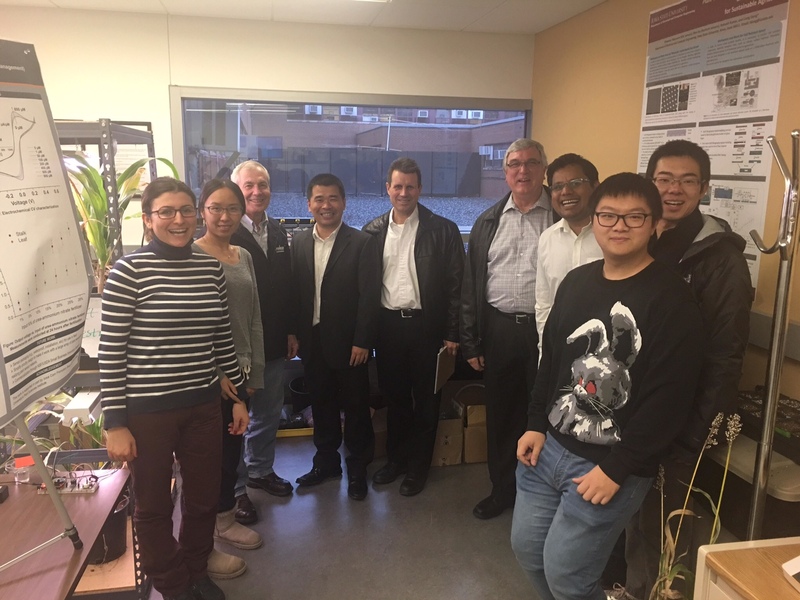 03/10/2014: Huawei's work on plant phenotyping in microfluidic chips was featured on the Back Cover of the 7 April issue of the journal Lab On A Chip. 02/25/2014: A two-institution team led by Dr. Dong was awarded a NSF grant. 12/16/2013: A team (Drs. Liang Dong, Zhiyou Wen, and Laura Jarboe) led by Dr. Dong received a seed grant from the Institute for Physical Research and Technology (IPRT) at Iowa State, to develop a lab-chip device for metabolic engineering of bacteria for bio-oil fermentation. 10/03/2013: Clinton Young joined our group as a Master student. Welcome! 09/15/2013: The Lab received a grant from NSF. 08/26/2013: The lab welcomes Seval Yavas (new Ph.D. student) and Erik Lee (new undergraduate researcher). 06/19/2013: Dr. Dong gave an invited talk at the Institute of Nano-tech and Nano-bionics, Chinese Academy of Science, Suzhou, China. 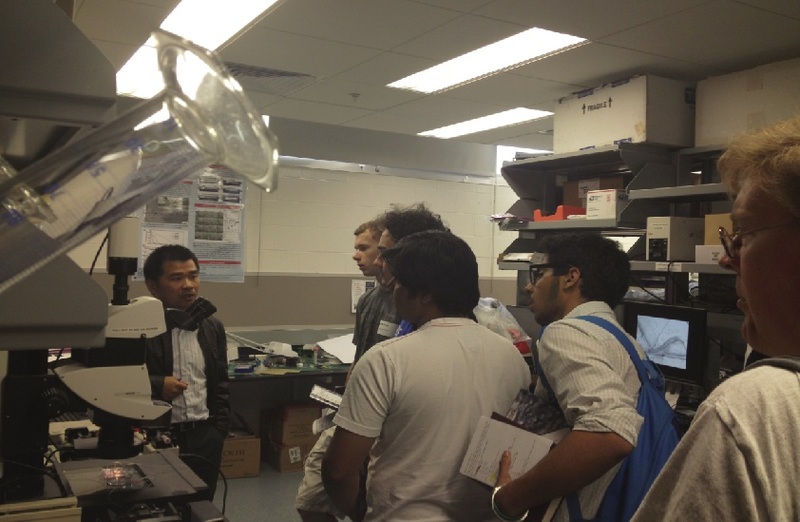 The title of the talk was "Microfluidic Biochips for High-throughput, High-resolution Drug Screening." 06/16/2013: Huawei Jiang presented her work on microfluidic seed chips at the 17th International Conference on Solid-state Sensors, Actuators, and Microsystems (Transducers'2013), Barcelona, Spain. 06/06/2013: Six graduate students (Depeng Mao, Huawei Jiang, Peng Liu, Yueyi Jiao, Zhen Xu, and Qiugu Wang) presented their works (NEMS optical modulator, microfluidic bioenergy device, and optofluidic cytometer) at the 4th Annual Nanofrontiers Symposium 2013, Columbia, Missouri. 04/26/2013: Congrats to Dr. Dong on his tenure and promotion to associate professor. 03/18/2013: The McGee-Wagner Research Fund grant was successfully renewed for the third year. Dr. Dong and Dr. Richard Martin appreciated the support for their lab-chip-based drug screening research. 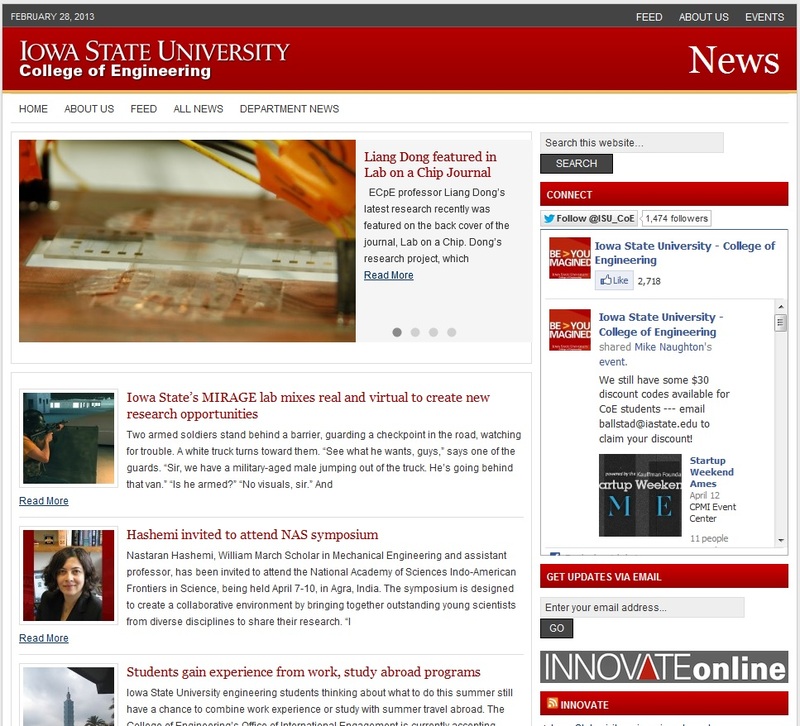 02/28/2013: Our work on Micro-Electro-Fluidic Grids was reported by ISU College of Engineering. 02/19/2013: Our work on Micro-Electro-Fluidic Grids was reported by Vertical NEWS. 01/24/2013: Our work on "Micro-Electro-Fluidic Grids: a lens-less, image-sensor-less approach for on-chip tracking of nematode locomotion" was featured on the Back Cover of the journal Lab On A Chip, issue 4, 2013. 01/7/2013: News article in Iowa State News about our work: Iowa State computer, electrical engineers working to help biologists cope with big data. This work was also reported in other media such as Phys.org, sciencenews.com, Sciencedaily.com, bio-medicine.org, USA Education News, and etc. 01/1/2013: Dr. Dong received a grant from the Iowa Department of Transportation DOT as co-PI on the $249,000 project to develop embedded MEMS sensors for monitoring structural health. The collaborators are Dr. H. Ceylan (PI), K. Gopalakrishnan, P. Taylor, and S. Kim from Department of CCEE and Institute of Transportation. 12/19/2012: Through the National Science Foundation-funded Wind Energy Science, Engineering, and Policy (WESEP) IGERT program at Iowa State, our lab has a Fellowship opportunity for domestic students pursuing a Ph.D. degree working on the topic of Wireless Micro-Electro-Mechanical System (MEMS) Sensors for Health Monitoring of Wind Energy Infrastructure. Click here to get more information. 12/04/2012: USDA awarded a 5.35-million dollars grant to a team led by Dr. Madan Bhattacharyya (PI) to investigate transgenic approaches to manage sudden death syndrome in soybean. Dr. Dong is one of the co-PIs on this project. 11/30/2012: Peng Liu gave a presentation at the Friday Activities at Noon (FAN) Club event to showcase several lab-chip technologies developed in our lab. 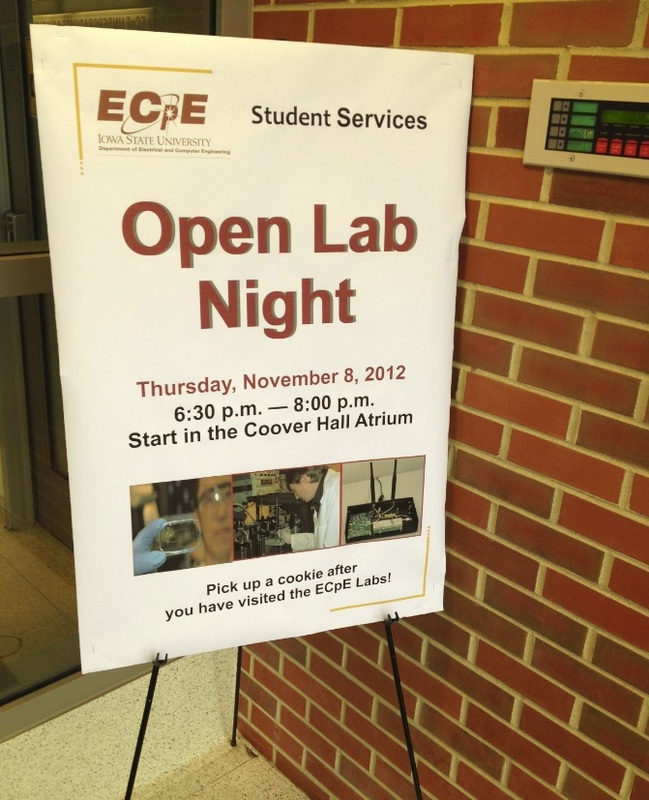 11/8/2012: Our lab participated in the OPEN LAB NIGHT event to showcase our research to the public (Photos 1 and 2). 10/25/2012: News release: "ECpE researcher completes lab on a chip device." 09/03/2012: Our research on optfluidic force sensors for whole-organism biomechanics was reported by Vertical NEWS. 07/06/2012: Haifeng successfully passed his PhD degree defense from Department of Electrical and Computer Engineering, Iowa State University. Congrats to Dr. Yang. 06/06/2012: Our lab received Interdisciplinary Innovative Research Grant from Plant Science Institute to develop lab-chip devices for plant science. 02/07/2012: Our reseach on coaxial light emitting micro/nanofibers was reported by MIT Technology Review (China). 02/02/2012: Our reseach on coaxial light emitting micro/nanofibers was reported by NAFIGATE. 01/02/2012: Our research on coaxial light emitting micro/nanofibers was reported by NANOWERK.